Mountain Thunder Townhomes are ski in/gondola out properties in Breckenridge CO Real Estate. These Breckenridge townhomes are located across the street from the BreckConnect Gondola and approximately 1.5 blocks from Main Street Breckenridge. 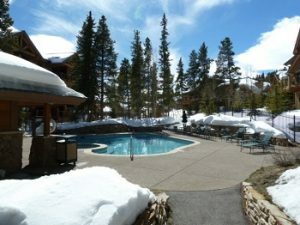 Mountain Thunder Townhome owners and guests have use of all the amenities at Mountain Thunder Lodge such as the outdoor heated pool, hot tubs, fitness room and more. Built in 2005 there are 34 Mountain Thunder Townhomes ranging in size from 1,051 – 1,610 square feet. There are 22 – 2 bedrooms and 12 – 3 bedrooms. The 2-bedroom townhomes have attached 1 car garages while the 3-bedrooms have attached 2 car garages. Each of these Breckenridge townhomes has slab granite countertops in the kitchen, stainless steel appliances, rock fireplaces and private washer/dryers. Mountain Thunder Townhomes are a must see when looking for townhouses for sale in Breckenridge Colorado Real Estate. For additional information about Mountain Thunder Townhomes, condos for sale in Mountain Thunder Lodge, past sales and market data contact Justin and Krystal Knott with LIV Sotheby’s International Realty in Breckenridge, Colorado.